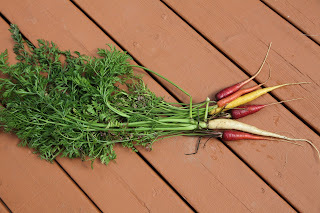 As an experiment this year, we tried some carrots that were promised to present a combination of colors. We dug a few today to check out the claim and agree that these are as advertised. We'll leave the others to grow to maturity. The rainy summer has been good for flowers. 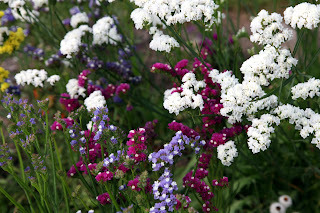 These statice will make nice ingredients for dried flower arrangements. They are ready for harvest and will be hung upside down in our basement to dry . 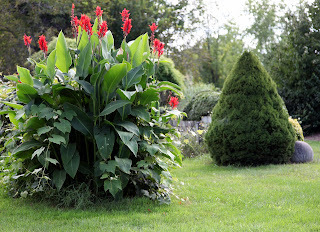 We use the canna lillies as an entrance point to some of our perrenial gardens. They are at the head of our row of grapes and brighten up the late summer and fall. At frost, we have to dig up the tubers and store them inside. Their spectacular display deserves the extra effort! The perennial grass garden stands as a welcome to our arborvitae maze garden (now 15-feet high). The grasses are arranged in a matching double tear-drop shape and are interesting all year long.